If you are looking for a reliable and professional company to supply you with a Digger and Drivers for your home or site today, then look no further. 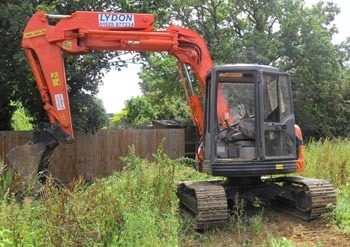 The Digger Man has a large range of Excavators, Diggers and Dumper Trucks to suit your needs. Please see our Diggers Page for Specifications. Our fleet are all well maintained and include Excavators, Midi Diggers, Mini Diggers and Skinny Diggers. We also have a good range of Dumper Trucks. Grab lorries can be arranged by request. Any of our fleet will be delivered punctually with our own transport and will be ready for immediate site work. Our HQ is based near off the M1 in Bedfordshire. We are ideally placed to visit your site in North London, Watford, St Albans, Harpenden, Bushey, Borehamwood, Hemel Hempstead or Mill Hill.